I have been trying to find numbers to represent the 4 forces. So far I have found the fine structure constant for electricity and the gravitational coupling constant for gravity. I think I may have found numbers for the other 2 but I need some help clearing up some pieces of information that seem to contradict each other. The number that seems to best represent the weak nuclear force is 0.652. This number solves the equation found here: http://en.wikipedia.org/wiki/Fermi_coupling_constant and is mentioned as being the value of the SU(2) coupling constant here: http://en.wikipedia.org/wiki/Standard_M ... ormulation)#Free_parameters. Since U(1) * SU(2) is the electroweak interaction the only one left over is SU(3) which must be the strong interaction. The value given to that coupling constant for SU(3) (from the last link) is 1.221. Unfortunately I found a problem with using these 2 numbers. This link: http://en.wikipedia.org/wiki/Strong_force says the strong force is 10^6 times greater than the weak force but the numbers 0.625 and 1.221 are only around 2 times greater than each other. When trying to learn more about the standard model I came across this: http://deferentialgeometry.org/epe/EPE3.html. The problem is I can't seem to find what ws, iwt, iw, g^3 and g^s mean. Also I was wondering why there were only 6 gluons shown when wikipedia says there are 8. I believe the issue with the weak interaction is that its effective strength is reduced by the fact that it is carried by massive bosons, which decay quickly. So while the intrinsic coupling constant is something like 0.652, the effective strength of the weak interaction relative to the strong interaction is only about 10^-6. Note that (in the first link you provided) to get the Fermi constant from the weak interaction constant, you're dividing by the mass of the W squared. So, the mass of the W diminishes the effective strength of the force relative to its intrinsic strength. Edit: I just took a look at that elementary particle explorer, which is rather interesting. It's been a while since I took particle physics, and I'm afraid there's a lot I've forgotten. But from what I remember, while there are eight gluons in total, two of those - g_3 and g_8 - are 'color neutral', so only six actually carry color charge, which I would guess is the reason only six appear. And I believe that somehow the color charge of a particle can be written in terms of those two color neutral gluons, which is what the g3 and g8 quantum numbers on that site must be. The omegas must be spin, though I'm embarassed to say I don't understand why there are two of them. So that site looks like its based on Garrett Lisi's theory of everything. Regardless of the truth or (more likely) falsity of his model, there is certainly a lot of non-standard-model physics represented there. However I think that Aiwendil is right that g3 and g8 are charges for the strong interaction. (if you want to impress your friends you can tell them that they are eigenvalues of the two casimir operators of SU(3)) whoops--should have said that they are the eigenvalues of the two generators you can simultaneously diagonalize in SU(3). The casimir operators are a different thing. The problem with coupling constants in quantum field theory is that they are not really constant. They change with energy (this is called running). The coupling constants you mention are taken at the mass of the Z boson, about 70 GeV or so, which is quite big by energies described by the standard model. You can find that information in the column 'renormalization scale' on wikipedia. The resolution is that the weak coupling constant becomes stronger with increasing energy. At lower (more typical?) energies, the weak interaction becomes less important. I think this is related to the issue that Aiwendil raised about the weak boson masses. Their mass is what makes the weak interaction short range, so it makes some sense (though I don't actually know if this is true rigorously) that the weak coupling constant would start becoming bigger as you get to energies above the weak boson masses and so can start to think of them as massless particles. On this site: http://hyperphysics.phy-astr.gsu.edu/hb ... ouple.html, you can see that the weak force coupling constant at energies of 1 GeV is indeed about 10^-6 times smaller than the strong coupling constant at that energy scale. Of course, finding a direct comparison of the strength of the different interactions is difficult. Why should we directly compare the coupling constants? EDIT: Upon further thought I realized that you need to appeal to the running of the coupling constants to explain your issue. The mass of the weak bosons is definitely the key point--at energies below the mass the 'effective coupling' will be suppressed because the mass is so big, at energies above the mass the coupling becomes bigger. What's going on is that our physical description changes drastically as you pass through the weak scale and so what you mean by the coupling constant changes. At low energies we describe things in terms of massive weak bosons, but above the mass we restore the electroweak symmetry and we have instead 4 massless bosons (the things that at low energies we call the photon and W and Z bosons). The coupling constant you described is the coupling constant appropriate for these bosons at high energies and in some sense that is the 'fundamental' parameter. At low energies however we need a different parameter to describe how the particles couple to matter, and in the case of the W and Z bosons this is an effective coupling constant that is suppressed in some way by the big mass. More technically, at low energies the propagator for a W boson goes like 1/M_W^2, so if you compute a scattering amplitude involving an exchange of a W particle you will pick up this factor of 1/M_W^2 on top of the gauge coupling g_2. This is basically the fermi constant. But this constant that you get is dimensionful. I'm not sure how you get a dimensionless number out of the fermi constant. Last edited by vainshtein on Wed Oct 10, 2012 9:39 pm UTC, edited 2 times in total. vainshtein wrote: Of course, finding a direct comparison of the strength of the different interactions is difficult. Why should we directly compare the coupling constants? Well, ok fair enough. The point I was trying to make was that comparing the strength of the interactions isn't always as simple as comparing the coupling constants. If you have scattering amplitudes then maybe it's ok (although there's issues like the one above where the 'fundamental coupling constant' isn't actually the right measure at certain energy scales), but there's more to the interactions than scattering. The strong interaction has confinement--does that make it stronger or weaker than the weak interaction? Obviously people have scattering in mind when the ask about the relative strengths but comparing them directly doesn't always make sense. But yes, the fact that the couplings all merge when you turn on susy (well, that three lines intersect at roughly one point) is intriguing. I am confused as to why these 2 links give different values for the gravitational coupling constant. The first one uses protons so maybe that is part of it but the wikipedia link makes it sound like it shouldn't matter what particle you use. Very good--this is really the crux of the matter. The gravitational constant has units. But if you want to compare it to other coupling constants you need to express it as a unitless quantity. So you need to fudge things somehow and make a dimensionless ratio. Essentially those two links have two different ways of fudging it. One looks at the ratio of the force between two protons gravitationally and electrically, and the second essentially will end up doing the same thing but for electrons. But it's true that in both cases you get different ratios--there is no 'intrisic' parameter in gravity that you can compare to something else. There actually is something deep going on here. A dimensionful coupling constant essentially means that your theory is going to end up being nonrenormalizable, which really means that your theory breaks down at some energy scale and some new physics takes over that you don't know about. So the fact that we have to deal with this problem of making up a dimensionless coupling constant is in some sense a reflection of the fact that we don't really know what is going on in the theory. 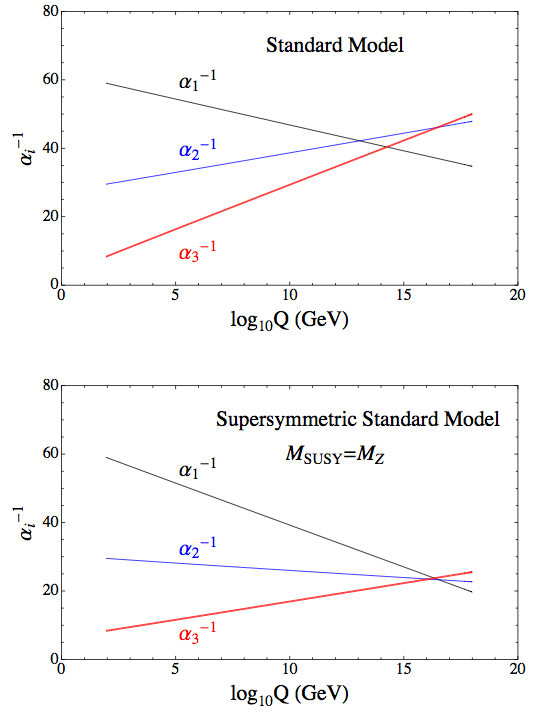 The fermi constant for the weak interaction, for example, is a valid description of the weak interaction between nucleons, for example, but is only valid for energies below about 100 GeV. At those scales the theory completely breaks down, and the resolution is the higgs mechanism--at higher energies you have a higgs particle that you can't ignore, and so you need to use a different, more complete theory which does not have the fermi constant. It will instead have a dimensionless coupling constant, which is that weak interaction coupling constant you cited above. A similar thing happens for gravity--gravity is a nonrenormalizable theory, which means that you can trust it as a quantum theory only up until a certain scale (the planck scale). One manifestation of this fact is that the coupling constant is dimensionful. So if there really is a different gravitational coupling constant for each particle all you have to do is find the coupling constant for each of these particles and then look for a pattern between them (hasn't anyone tried to do this?). The energy scale problem can be solved by using the energy scale of a certain particle just like it is done to create the SU(2) coupling constant. Also I am still really bothered that wikipedia doesn't mention anything about more than one gravitational coupling constant so I basically have to believe some site I don't know much about. Now that I think about it more using electrons makes more sense than using protons since electrons are much smaller. Neutrinos might work better but the mass of them isn't known and they might be too small since they pass through most things. I wouldn't say it exactly like that, I would say that there is one coupling constant but it has dimensions. Because of this it is true that you want to compare the force (more properly a scattering amplitude) between gravity and electromagnetism, you will get a different answer depending on the mass of the particle involved. all you have to do is find the coupling constant for each of these particles and then look for a pattern between them (hasn't anyone tried to do this?). I'm really not sure what you would like to do here, what kind of pattern? The energy scale problem can be solved by using the energy scale of a certain particle just like it is done to create the SU(2) coupling constant. This energy scale in fact has a name--it's the Planck scale or Planck mass. So we can use gravity as an 'effective theory' (classically and actually also quantum mechanically) so long as the energies of the particles involved are less than the Planck scale. But if the particles have more energy than that then we really need to include some new physics that we don't know yet (maybe string theory). Yes that wikipedia article you linked to was not very well written. so I basically have to believe some site I don't know much about. Now that I think about it more using electrons makes more sense than using protons since electrons are much smaller. Neutrinos might work better but the mass of them isn't known and they might be too small since they pass through most things. Not sure what you are getting at here. You have to be specific about what question you are asking. If you want to compare the gravitational force to some other force, you can do that particle by particle. You could use electrons to compare e/m to gravity, but obviously you wouldn't want to use chargeless neutrinos to do this. There is no fundamental reason to pick one particle over another though, and there is no one dimensionless coupling constant describing gravity (yet). Any kind of pattern he can find, whether it exists or not. If you take a look at some of scratch123's other posts, there's a lot of what boils down to numerology done with various numbers from science. A dimensionful coupling constant essentially means that your theory is going to end up being nonrenormalizable, which really means that your theory breaks down at some energy scale and some new physics takes over that you don't know about. Be careful about this, while you can find lots of physicists who say things like this, they aren't strictly true. Non-renormalizable really just means that there are scales where we can no longer effectively use perturbation theory to get numbers out. There is nothing NECESSARILY unsound about non-renormalizable theories. Weinberg has spent a lot of time on the potential asymptotic safety of general relativity, for instance. If he is right, GR IS already the quantum theory of gravity. So while I am familiar with the basic idea that nonpeturbative effects can kick in at the cutoff scale and potentially make the theory finite (in contrast to the perturbative solution of integrating in another particle), I am not very familiar with the idea of using asymptotic safety to make a theory finite. However it sounds very interesting and I'd like to learn more. My initial response is, how do you calculate the beta function if you can't trust perturbation theory? You would have to compute the running of the gravitational constant to arbitrarily high energies and show you had some fixed point, but my understanding is that beta functions are computed to a certain order in loops (ie perturbatively). Also, naievely I would expect that you would have to start worrying about all the nonrenormalizable operators at energies above the cutoff scale, and so you would have to worry about the running of an infinite number of coupling constants.